Now that OSCR360 has been around for a few months – and getting lots of use by dozens of municipalities in New York State – we’ve had a chance to get some user feedback. After all, we pride ourselves in developing solutions and equipment that directly reflect what our customers want! While chatting with those who are using OSCR, we’ve answered many, many questions and began to compile a list of the most frequently asked questions (FAQs) from law enforcement and attorneys. This blog is the start of a series that will provide the answers to these FAQs, so keep reading and stay tuned for even more answers! Where did OSCR360 get its start? About 10 years ago, a local Rochester photographer was serving Jury duty. During deliberation, it became quite clear that everyone saw and heard something completely different; it was as if they were sitting in the same theater, watching a different movie. Thinking to himself, “there’s got to be a better way” the photographer set out on a journey to create a 360° camera. L-Tron has been working with law enforcement for 17+ years with our 4910LR Driver’s License Scanner. It was because of that close working relationship that OSCR360 came to fruition. About 2 ½ years ago, the photographer came to L-Tron with his high-definition, hi-tech 360-degree camera. Our response, echoed by law enforcement’s was “You have to make it simpler.” We also knew that, yes, 360-degree photos are neat. However, what you can do with those 360s is where the real value is. We then set out to develop OSCR360 into what it is today. 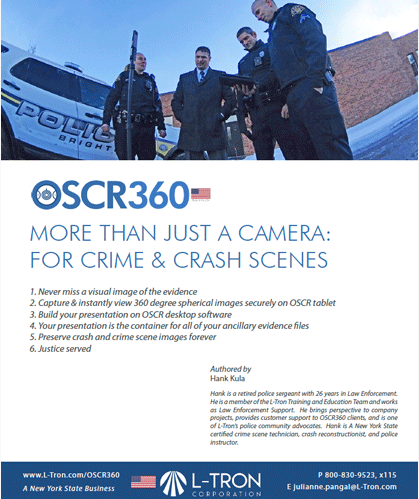 OSCR360 is a 360-degree camera and software solution revolutionizing crime & crash investigations. The solution has 2 portions: the OSCR360 Capture Kit and the OSCR360 Desktop Software. The OSCR360 Capture Kit includes all the equipment you need to capture spherical photos at a scene. There are 3 main components to the OSCR capture kit. First, the 360-degree camera, which is a stationary camera that instantaneously captures a spherical photo. Second, the L-Tron Sensor Tube, which records your GPS data along with cardinal direction for every photo that is taken. Finally, mounted on a tripod, the OSCR capture kit is controlled via the tablet. Designed with simplicity in mind, capturing photos is as easy as 1…2…3 – Connect, Name, Capture a photo. To see this at an in person demo, contact us here. The second piece to the OSCR360 Solution is the Desktop Software. Here is where the magic happens. 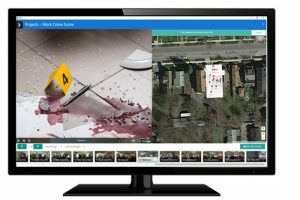 The OSCR software allows you to contain and organize all of your digital, evidentiary files in one place and ultimately take someone on a virtual tour through the scene. With the ability to add your scene sketches to the map section of our software, you can quite literally walk someone through a house, building, outdoor scene, crash scene, etc. Using OSCR360 as a container to organize and investigate your cases further, points of interest (POI) allow you to add in any supporting digital evidentiary file related to your case. 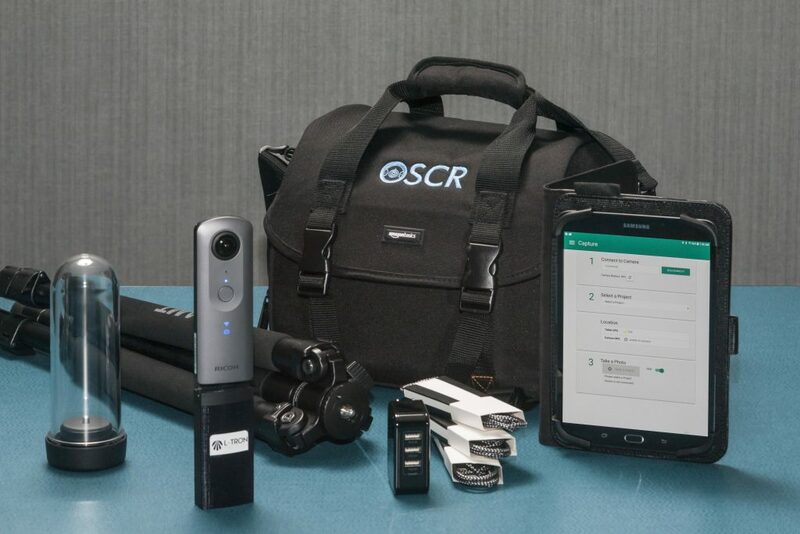 DSLR still images, PDFs, bod cam footage, security cam footage, medical examiner reports, intoxication reports, total station data, laser scan images, etc; anything you have related to your scene, OSCR can hold. An expert once told us, “A good investigator never stops investigating.” With the OSCR360 Desktop Software, you don’t have to. Click to read Part II in this OSCR360 FAQ series.